Pet styling and dog grooming are wonderful careers that have many benefits. You will get paid for doing something you truly love! Pet stylists and dog groomers are excited to come to work every day to help pets look and feel their very best. Not only will you be making the animals look and feel better, but you will also make their owners happy and proud. Pet styling and dog grooming are career choices that offer personal rewards, financial opportunities, variety, creativity, and daily recognition. Personal rewards come in four-legged packages; all sizes and colors, short hair, long hair, some shy and some outgoing. They come to you for their "magic makeover". Afterwards, as you watch them and their owners happily greet one another, you receive a warm feeling knowing you contributed to this happy moment the two of them share. Pet styling and dog grooming is a career choice - it is not for everyone. If this career is for you, come to Just Four Paws Academy of Pet Styling and, in as little as 8 weeks, you can make your dreams come true. Our instructional programs at Just Four Paws Academy of Pet Styling can prepare you for your dog grooming or pet styling career ahead. 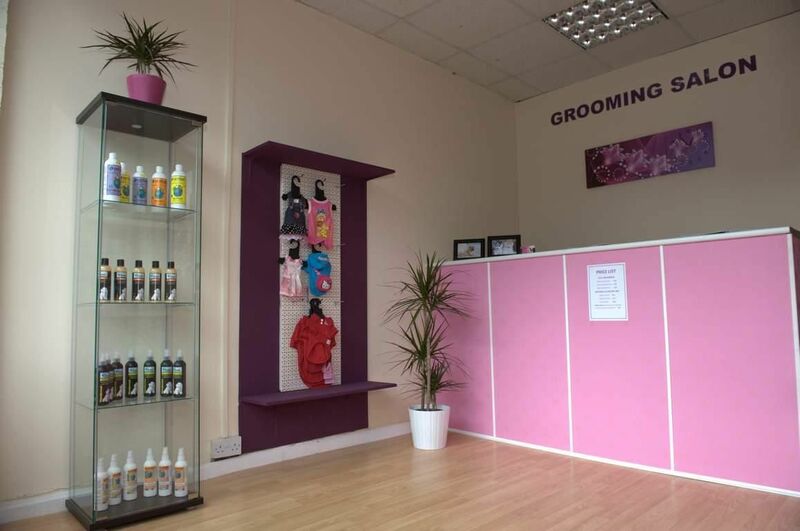 Pet styling and dog grooming offers exceptional employment along with the choice of being in business for yourself. Pet shops and dog grooming are a perfect match. As a business owner, this concept offers two strong incomes. The daily pet grooming brings in a steady clientele along with retail sales. Puppy sales create future clientele when owners return for their pet's grooming and supplies. The atmosphere in the pet shop setting is one of fun with lots of activity which makes it a nice business for couples or for families who would like to build a business together. Mobile pet grooming is an exciting new concept in the pet care profession. This concept offers you the flexibility needed to create a more enjoyable environment. As a business owner, you can structure your appointments to fit your lifestyle. Need an item for the house or family? Make a quick stop along your route and pick it up. Need a vacation? Book your pet grooming appointments around your vacation time. The mobile pet grooming concept enables you to have some control over your career. As a mobile pet grooming employee, you have a structured route and are in charge of the daily operation. Salon pet grooming is for the business owner who would like to develop a larger enterprise. Pet retail items can also be added for extra income. As an employee, the salon pet grooming atmosphere enables you to work with other pet stylists as a team. This support and camaraderie creates a warm, personal working atmosphere along with a nice income base. Pet boarding, pet daycare and pet grooming are the perfect match in the pet care industry. For those who like the pet "Bed & Breakfast" concept, along with pet grooming, then this avenue is worth exploring. As an employee, the client base (depending on the size of the pet daycare) can offer you a strong income potential along with a nice working environment. Veterinarian clinics offer good salaries and working conditions for dog groomers. It may be possible to sublease some of the space within the clinic setting to create a business for yourself. Veterinarian medicine is the most important component in the pet care industry. Whether you are an employee or an in-house business owner, you will benefit from their professional image. Do you have a soft spot for animals that end up in rescue shelters? These beautiful creatures sometimes need all the help they can get in finding a new family that will love them. Their coats and fur may be severely matted and they may not smell the best. However, with the help of the professional pet stylists who work at such shelters, these animals are able to look better (and thus, feel better! ), making it more likely that they will be adopted and loved for the rest of their lives. Begin your pet grooming career today. Enroll now for classes at Just Four Paws Academy!